lesliekeating: on pinterest. and flickr. and a bit on copyright. on pinterest. and flickr. and a bit on copyright. i've been on pinterest since pretty early on and have been following all the copyright controversy with interest (if you have no idea what i am talking about, google "pinterest and copyright" and prepare to have your mind boggled). i use pinterest as my own personal pinboard, to keep track of inspiration, recipes and tutorials. no, i don't always credit where the image came from, actually i barely ever do, but since you just have to click on the image to find the original source (or the source where it was pinned from, anyway) and see it in context, i don't really see the need. and i don't really see the harm in sharing images via pinterest, except that some people don't want to and don't have a way of controlling it and aren't happy about it and that is fair enough. so i tried to pin one of my own images from flickr yesterday and was confounded by text reading "sorry, you cannot pin this image" over each of my own photos. a bit of google research led me to the knowledge that flickr has implemented an universal "opt out of sharing" feature and it is automatically set to not share (by the way, flickr, it would have been nice to have an email or something about this new policy and how to tackle it - did i miss that?). i mucked around with my sharing and copyright features for ages but just could not get my images to pin so i sent a quick email off to their help dept. anyway, they answered back within 24 hours which was great and i thought i'd share the info sent in case anyone else actually wants to share their images via flickr (my blog pics are from my flickr photostream too so if i didn't change my settings, no one would be able to pin anything from this here blog either). 1. Go to Organizr by clicking "Organize & Create". 2. Select the photos you'd like to include. 3. From the "Permissions" menu, click "Hide/show in public searches". 4. Please make sure that the checkbox is not selected. ps. i previously had all of my images set to "All rights reserved" but have just changed to the creative commons license "Attribution-NonCommercial-NoDerivs CC BY-NC-ND" which means "allowing others to download your works and share them with others as long as they credit you, but they can’t change them in any way or use them commercially." if you want to learn more about creative commons, you can read about the license options here and can implement them to all or select images in flickr (still can't stop someone from just downloading your pic and doing what they will with it but at least you've made your preferences known and have a legal foot to stand on should the need arise). Thanks Leslie. I had noticed that about Flickr but hadn't thought to go in and change it. Cheers! Thanks Leslie, think I have fixed it. Thanks for the heads up Leslie - that was really helpful! i never heard this before but just went to do a test pin from my flickr and had no problem...maybe they were just selective? yeah, it's weird, in the reply to my question they mentioned that my opt out preference was "enabled" but i definitely did nothing to enable it, haven't changed any of my flickr preferences in years, in fact. wonder why some automatically changed and some didn't?? wow, thanks! I was also confounded by the sudden inability to pin *my own images*. I love pinterest! I respect that people don't but it's been a godsend to me. However, I wish that when someone pinned from my flickr stream that it would credit me .. not just flickr.com. That way I could actually see which images were being pinned the most. And / or a way that they could pin from my blog (the pics I have chosen to share) but not from my entire stream (maybe pics I'd like to show but not share). Nope. I don't want my images to be CC because they anyone can take them for their own purposes, not just for pretty Pinteresting. Wrong answer. dear anonymous, what you choose for your photo rights is up to you. i'm offering some legitimate information for people to make their own choices. i personally don't want to scare people off of sharing my pics because the images may lead them here, they may like what they see and buy some of the fabric that i love creating so the creative commons license seems like a good option for my purposes. I'm just not okay with blindly allowing anyone to share my pictures anywhere they want. I would be fine with them being on Pinterest, which links back to my flickr account or my blog. But, sites like Tumblr DON'T link back, and there is no way on Flickr to allow pinning without allowing ALL sharing. Its a shame. If you do find a way to enable sharing on only select photos, please let us know! yep, totally agree with that, tumblr is a problem. super frustrating when someone pins something from a tumblr site and then all credit is lost. boo to tumblr. Thank you for the link. 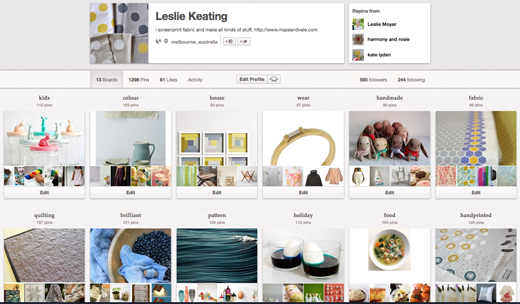 I just love your pinterest pages - and I'm new follower. You work is so beautiful. This is a very neatly written article. I'll be sure to bookmark it and return to learn extra of your useful info. Thanks for the post. I will definitely comeback. i also have you bookmarked to check out new information in your blog.